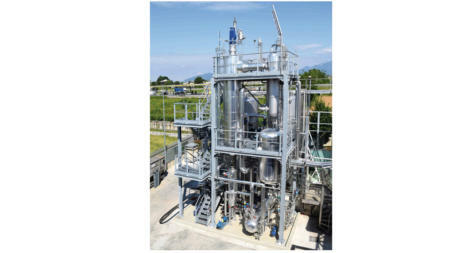 In the lube oil industry, the term "recycling" is different from "re-refining". "Recycling oil" or "reconditioning oil" is most commonly referring to using commercial filtration systems to remove insoluble impurities. The resulting oil here has very limited uses because of the stringent safety and environmental regulations. Re-refining on the other hand is a process that removes all impurities, both soluble and insoluble, and returns the oil to a quality suitable for several application, including automobiles. 3V Tech supplies Modular Used Lube Oil Re-refining, skid mounted systems, ready for immediate installation. The capacity of Modular Re-refining Unit is ranging from 8,000 to 20,000 MTPY. 3V Tech modules include a Thin Film Evaporator TFE, a Short Path Evaporator SPE, vessel, heat exchangers, vacuum sets, pumps and motors, filters, control system, instrumentation, piping and structures. The Modular unit is designed and fabricated in accordance with International codes and Standards (ASTM, ANSI, API) as well as International environment specifications for wastes and emissions.